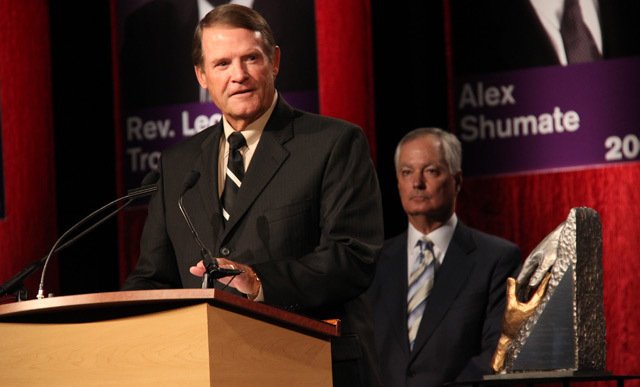 Mike Morris accepts the 2011 American Red Cross of Greater Columbus Humanitarian of the Year Award as BIll Ingram, president and CEO of White Castle System and a previous awardee, looks on. Mike Morris, AEP chairman and chief executive officer, was honored Tuesday with the 2011 American Red Cross of Greater Columbus Humanitarian of the Year Award. Morris is the 15th individual honored with the annual award presented since 1997, in recognition of his contributions to making the Columbus, Ohio, community a better place to live, work and play. AEP’s chairman and chief executive officer was honored at a luncheon attended by numerous central Ohio leaders for his sense of caring for people, his vision, integrity and leadership, and his dedication to building better communities. “Since joining the greater Columbus community in 2004, Mike has, often quietly, stepped up to leadership roles for organizations like the Scioto Mile, the United Way of Central Ohio, the American Red Cross, and many others,” said Michael Carroll, chief executive officer of American Red Cross (ARC) of Greater Columbus. Carl English, AEP vice chairman, was one of several AEP employees, as well as community leaders, who participated in a video tribute to Morris. “He puts the needs of others ahead of his own in so many cases,” English said. English said that through Morris’ initiation, the AEP Chairman’s Lifesaving Award recognizes the efforts of employees who save the life of a fellow employee or a member of the community. “Mike wants to make sure that they are recognized as someone special,” he said. He added that through AEP and the AEP Foundation, significant contributions have been made in communities across AEP’s service territory. 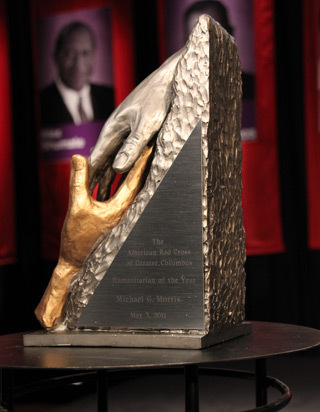 The Humanitarian of the Year Award from the American Red Cross of Greater Columbus. In accepting the award from Carroll, Ingram and Kirt Walker, chair of the ARC of Greater Columbus, Morris said he represented the thousands of employees of American Electric Power, and the many roles they play in leading, helping and serving in their communities. “The easiest thing to do in the world is to give of yourself,” Morris said. He noted that during his boyhood, he followed the leadership of his father in helping fill sandbags during the flooding of a local river. “You learn that by reaching out and helping others, it could easily be you that needs help,” he said.